(Lancaster, Pa., March 30, 2018) - Although he has not spent a full season in Lancaster since his MVP year in 2012, Blake Gailen has been a big part of the last five years as well. Now, he has been signed by the Barnstormers for a seventh consecutive year, it was announced today by manager Ross Peeples. Gailen, 33, stands as the Barnstormers all-time leader in runs (309), hits (524), home runs (71) and doubles (109). He is tied with Jutt Hileman (2005-08) with 273 career RBI and trails only Hileman in games played and at bats. He carries a lifetime Lancaster batting average of .312. In 2012, the California native won the league batting crown at .338 with 22 home runs and 89 RBI, earning not only Player of the Year honors in the Atlantic League, but Baseball America’s Independent Baseball Player of the Year honors as well. Over the past five seasons, he has spent a portion of each season with the Barnstormers, but his contract has been purchased by the Angels, Dodgers and Blue Jays as well as by Tijuana of the Mexican League. He missed the start of the 2016 season while recuperating from off-season surgery. 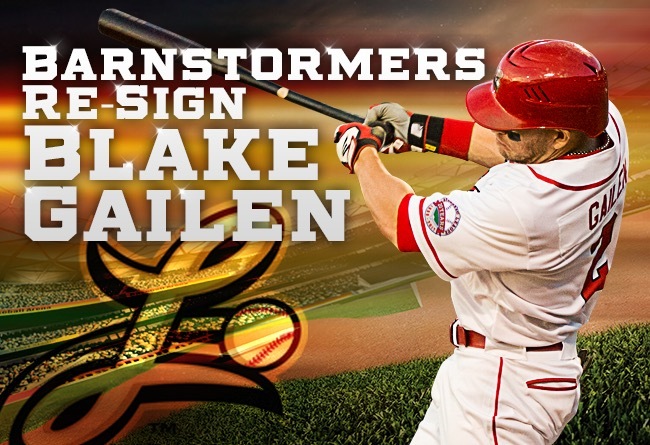 Gailen opened last season with the Barnstormers, batting .323 with eight homers and 30 RBI in 54 games. His contract was purchased by the Dodgers, who assigned him to Class AA Tulsa. The UNLV product batted .300 with seven home runs and 35 RBI with the Drillers, helping them get to the league finals. He was released by Los Angeles out of its minor league camp last week as was right-hander Scott Shuman, who will be returning to Lancaster as well. Shuman had signed his 2018 contract with the Barnstormers in January.